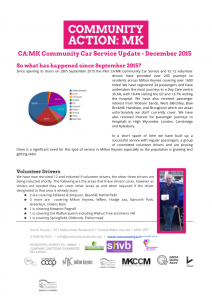 Since opening its doors on 28th September 2015 the Pilot CA:MK Community Car Service and its 12 volunteer drivers have provided over 200 journeys to residents across Milton Keynes covering over 1600 miles! We have registered 34 passengers and have undertaken the most journeys to a Day Care centre 39.6%, with 18.4% visiting the GP and 13.7% visiting the hospital. See the February 2016 update below.